Have you ever gotten bad reviews? How did you feel? What did you want to do to your customer service reps? Question is what DID you do about it? One major key and essential part of business is relationships. When a customer walks through your doors they are looking for someone who can provide them value. When I say value I mean primarily trust. They want to get to know you. One of the ways to ensure that they have that trust in you is to follow up. Businesses can be tempted and get overwhelmed by the amount of things they have to take care of that they neglect to build upon the initial foundation of trust. You got that one sale. They came to your website or brick and mortar store. How do you get them to come back? How do you get to know what else they need? Finally, how do you get their friends to come and pay you a visit? The key to this is testimonials & reviews. Bottom-line, it’s free marketing for your business. Why? Now that you treated them nicely, your customer service reps answered their questions nicely and in a timely manner, they got what they needed and were looking for plus more, it was easy, it was smooth and clear they will now want to share this experience with their friends. Or will they? Many consumers will buy the product possibly walk away with a good taste in their mouth and never come back let alone share their experience. Oh they will share a bad experience very quickly but not necessarily a good one. Keeping them on your radar is part of marketing. So when I said it’s free advertising that’s both a true statement and not. You as a business owner will have to invest time and money to remind them of their interaction with you, your business and your product. Send a survey via email. Have a survey pop up when they finish shopping. Have one of your customer service reps call them in a month and ask them for feedback. Send them a thank you note (email or snail mail) for their business. Yes this does take time and money but it’s well worth it. 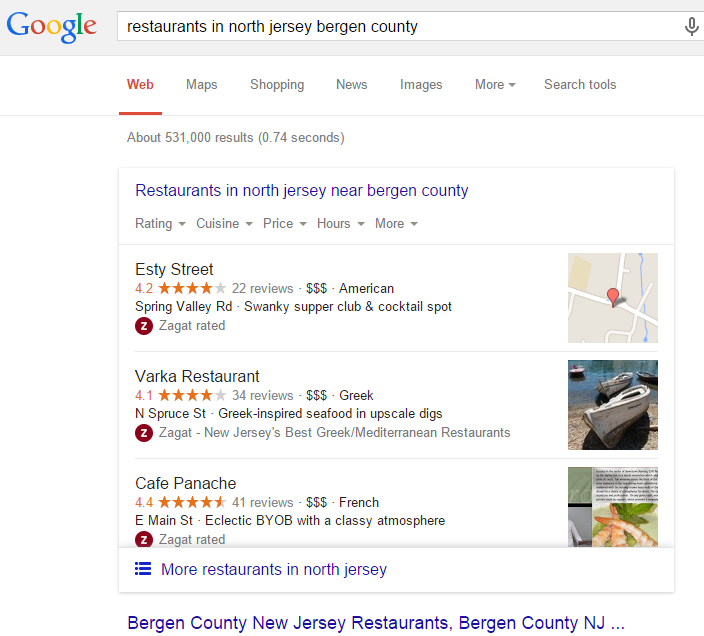 Google is now showing results based on positive reviews (see image). Reviews can be shared on your site, Google, Yelp, or other third party sites. This makes a big difference for your future business, ORM, and where you show up when someone searches for a product or service you sell online.